Whittlesford is a South Cambridgeshire village, it is situated on the Granta branch of the River Cam, and is just seven miles south of the City of Cambridge. Whittlesford Parkway Railway Station serves the village and offers excellent rail links to London Liverpool Street. The population of the village is approx. 1,200, the village is just one mile from the Imperial War Musuem at Duxford, at Junction 10 off the M11. Directly opposite the IWM is the Officers Mess and the Old MOD houses of Ledo and Burma Road, these also form part of our parish. 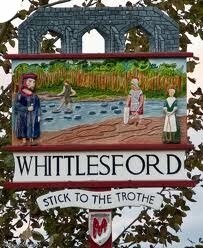 Whittlesford has a village shop & post office, 2 pubs, a social club and a hotel. Our membership is currently about 360 households. Regular activities include guided walks, meetings with expert guest speakers and exhibitions of photographs, memorabilia and archaeological finds. Our journal, “Whither Whittlesford”, is published at least twice a year and focuses on village events, local, social and natural history. Other publications dealing with specific aspects of village history are also available.